With one lap top in the house between five of us (and with three of us wanting to use it regularly - and generally all at the same time) something had to be done today, which is why we ended up in PC World buying one for the eldest two to share. The down side is that it won't be ready until tomorrow - hence the late post as I have only just managed to wrestle this one from our eldest. As you may recall, on Thursday evening I ran a Style Event at LK Bennett in Birmingham. My friend Lisa from Glamour in the County has kindly provided me with some shots of the evening. It was lovely to see many ladies come along - and in aid of such a good cause. The evening was to raise funds for Marie Curie and in particular to enable a family room to be built at a new hospice. So, to set the scene - here are ladies arriving, chatting and buying raffle tickets - we had some great prizes including a Hamper from Harvey Nichols (the Birmingham HN is fantastic, very supportive of local charities) a meal at Malmaison and a hair do at Nicky Clarke. Here I am chatting with one of Birminghan's best known bloggers, Emma from Fashion Mommy who knows everything there is to know about getting in with those in the know! More chatting and fizz, supplied courtesey of LK Bennett. Two amazing ladies who raise funds so tirelessly for the charity - Dawne and Anne - with me standing on the side lines as Anne introduced me. Anne was great at calling the room to attention. Whilst I am happy to do the presenting part, I hate interrupting everyone to ask them to come and listen! I think it looks as if the ladies are listening. That's more than I get at home! Chatting animatedly about the pieces I had chosen for the evening. Fortunately the ladies bought a lot of pieces after the presentation, which I was so relieved about! This lady was wearing a great outfit and we were talking about from where she had bought it - and how she had pinched the H&M bangles she was wearing from her daughter. I liked her style - in more ways than one! These were the shoes that this lady was wearing. I thought they were amazing but sadly she bought them in Milan - so that's probably where this tale ends! It was such great fun and raised £400 towards the £100 000 target. Still a long way to go (the sum of £40 000 has been reached) - and still a few more events, style or otherwise, to go - but I have no doubt that they will get there. For the event I wore the Gina Crepe Long Sleeve Shirt and the Fleet Chiffon pleated skirt, both £145 and both of which I loved (the shirt was surprisingly warm) and my own LK Bennett sledge shoes. The shirt is a really versatile piece and could be worn with cigarette pants, heels and a blazer at the weekend, to work, or more casually with jeans a knit and ankle or biker boots. The skirt I too would dress up, as shown here, or with a sparkly top, or down with a chunky roll neck and block heeled ankle boots. Thank you to LK Bennett for the loan of the pieces! Mum on the Run - What to wear for Style Birmingham with ten minutes to go? Cleverly, I managed to leave myself 10 minutes to get ready for Style Birmingham today. I had it in mind to wear a dress and because the Mailbox, where the event was held, is not all undercover I knew that I would need a jacket with some warmth in it. Despite the fact that I have been blogging for over two years now, I don't think that this dress has ever featured before. I really like it but don't often get to wear it so today was the day for it to have an outing! This dress was actually chosen for me by someone else. I was styled in it by another girl (Dreda from Just Style Me) on my styling course and I loved it so much that I went on to buy it. It was so different to anything I would have normally chosen for myself and the fabric and structure are really unusual. It was from All Saints. Dreda is great and is based in Kent, so if anyone is looking for stylist in that part of the country, she's your girl! There's a lot going on in the collar area, so I kept the rest of the outfit very simple. The collars sat better together earlier in the day and arguably it would have been better to take photos before I left, rather than on my return home. However when I left not only was I short of time but my nails were wet in places where I patched up the chips in my shellac nails with a Primark nailvarnish. Classy! Anyway, here is a clearer look at the dress. This is the closest to the dress that I can find - it's the Marilyn Dress from All Saints and costs £165. Sorry about the poor quality photo - just follow the link for a better shot. And here, amongst other thing, is a momento of the day - which I think has already been acquired by our eldest. Unfortunately it was too dark inside the fashion show to take photos but hopefully I will have access to some professional shots soon. Tomorrow I am off to the park with the youngest to collect those things which fall off the trees at this time of year - those things being coconuts apparently! I was really pleased that a client I was with today made full use of the 25% discount in Whistles, courtesy of the voucher in this week's Grazia. She bought some great pieces, which really put a smile on her face and for me, that's what it's all about. Purchases were also made in Next (great for coloured skinnies and cords) French Connection, Gap, Oasis, Dune, the White Company and others besides. We had a great time and I hope that right now she is trying everything on! So, as to the panel dresses. You may have seen a few of them around this season. They first appeared last Autumn with Stella McCartney designing this "Miracle" dress, most often seen on Kate Winslet. The black panels do a great job of slimming down the width of the torso. They are a brilliant optical illusion and a fantastic styling trick. I picked this Lucia Panel Dress (£60) up from Oasis a couple of weeks ago. I was interested to see what it looked like when on. My verdict? The design has to be spot on or there is a risk of looking slightly freaky - a little like when someone has had too much botox or too much collagen in their lips and their features don't quite sit right any more. If I am honest, I wasn't terribly fond of the Stella McCartney dress. For me, it was just a bit too extreme in its shaping, which was a shame as done well they can look great. I decided not to keep this dress. It actually had a little too much room in it and when I walked, it rode up. Having said that, if it had fitted a little better I might have been tempted. Because it can be such a flattering look, if you spot a panelled piece that you like, I advise you to give it a go and see what you think. I have even seen them in Per Una and actually the dress in question was quite nice - I went so far as to buy it for next week's Style Event. I am off to Style Birmingham tomorrow for lots of fashion, fun and fizz so will report back later! It's late and I have only just got back from presenting at a Style Event in LK Bennett Birmingham, so this will just be a short one! Here are a few snaps which the lovely girls in LK Bennett took for me earlier as I was editing the pieces from the collection about which I wanted to speak this evening. Two of my Birmingham blogging friends were there, Emma from Fashionmommy and Lisa from Glamour in the county and they took some great photos, which I will feature in another post. The event was in aid of the Marie Curie Big Build Appeal and specifically we were raising money for a family room at a new hospice. When built, it will enable families to stay together whilst their loved ones are being cared for. The target is £100,000 and tonight the £40 000 mark was reached, which was fantastic. So many give up so much time for free that it is mind blowing. LK Bennett provided fizz, canapes and a 20% discount on the night and I gave a 20 minute or so presentation, which people seemed to really enjoy (either that or they were just being polite). The final figures for LK Bennett were fantastic. After my presentation they sold £3,500 worth of clothes and all but one piece came from those I had edited out of their collection and spoken about - which was great to hear. I didn't wear this on the evening but instead was lucky enough to borrow an outfit from LK Bennett (photos of that to follow too). Here I am wearing my new Primark coated jeans, Zara boots (which I haven't taken off for many days now) and a New Look denim shirt. Mum on the Run - A very stylish lady in a great weekend outfit with lovely colours, courtesy of Whistles, Boden, H&M and a Newcastle boutique. I really want to say such a big "Thank you" to everyone who read yesterday's post and/or commented on it. 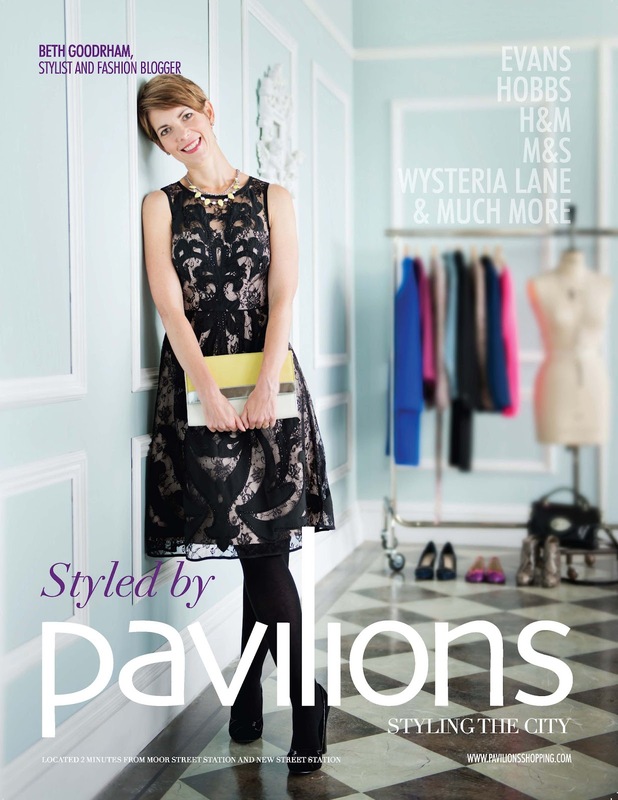 You all said a lot of things about the Pavilions campaign, from how you liked the clothes, to how nice it was to see a "real" woman fronting it, to how the outfits have provided ideas and inspiration. It means a lot to me to have the support of so many lovely women - and I just wanted you all to know that! After yesterday, I thought that today I would give you a rest from me prancing around in fancy frocks and instead bring you my lovely friend Vicky, who always looks stunning - whenever and wherever. Vicky is one of those ladies who is always immaculately turned out - the kind of lady who always has hand cream and a proper hanky in her bag, of which she has a fine selection - (bags that is, not hankies, but probably hankies as well)! Vicky is my partner in crime on our day trips to Leeds, which is the half way point between our respective homes. We try and meet a couple of times a year for some lunch at Harvey Nichols, a good catch up and a spot of shopping, naturally. We also swap stories of anything new we may have bought, how good it was, how it wore, whether it was good value - the usual girlie stuff really! On Saturday morning we managed to get an hour or so together. The scarf that Vic is wearing is from Whistles and she picked out the vibrant blue and yellow colours in it in her bag (Newcastle boutique) and her cardi (Boden). She also layered a H&M breton style top underneath it (we both rate them). Her boyfriend style jeans are from Esprit (free delivery and returns) and her boots are from Clarks (which she bought with a discount code). Such a fantastic outfit for a weekend away involving lots of children. Ah, such a lovely friend! As an aside, we thought it was jolly good of the Council to make sure that their barriers matched her outfit! Way back at the end of July, I was working at a style evening with Hobbs at Pavilions shopping centre in Birmingham. I recognised two of the ladies there as having been the stars of the Pavilions Birmingham campaign, which had run a couple of months or so before. 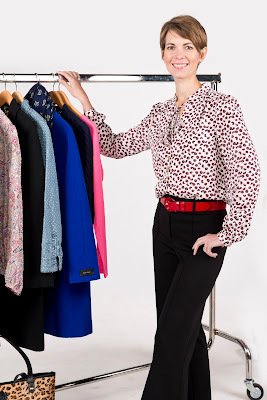 Instead of opting for models to showcase fashion available at Pavilions, the centre instead asked local successful business women to front the campaign. I thought that it was great – real women with inspiring stories from our fabulous City. It was great to hear about their experiences, about being styled and being models for the day – something which they would normally never have had an opportunity to do. A few weeks later, I was driving along when I received a phone call from Pavilions. Despite the noise of the 500 (or so it felt) children in the car, I understood the gist of what they were saying, which was this: would I like to be both the ambassador of, and the stylist for, the next Pavilions campaign. It wasn’t as if I needed to be told anything more to seal the deal but finding out that I was to spend a day choosing 8 outfits from the stores within Pavilions, and then another day being photographed in them, was all I needed to hear! Now, I’ve never had illusions of being something that I’m not but the whole idea of shopping for a day and then being treated to a photo-shoot with a professional hair and make-up artist sounded like a nice distraction from every-day life - particularly as it was nearing the end of the summer holidays! I approached the shopping day with military precision. I had lists of the trends that I wanted to include, the looks that I wanted to embrace, the age bracket to which I needed to appeal, the mix of the brands to be included plus many other things beside. By and large it went according to plan – and anyway, as a stylist, thinking on your feet and reacting to what’s available is a good thing! The following day I found myself in a very desirable part of Birmingham, standing outside an industrial building staring at a metal door with no-one else in sight. I persuaded the taxi driver to stay with me until someone else arrived, knowing that although I was probably only a few miles from home, I didn’t know in which direction that was. Anyway, the team started arrriving and the taxi driver left me to it. The photographer’s studio was amazing – it covered the whole floor of this largely deserted building. It reminded me of the warehouse that the actress lived in, in the film Flashdance! So cool! During the course of the day there were many outfit changes, many set changes, many changes of pose and of make-up. Inevitably some outfits worked better than others (and one or two I have since bought)! There was also the vlog to film. Standing in front of a camera talking about clothes, trends, accessories and fashion in general, with a whole room of people looking is slightly unnerving but everyone was so supportive, even when I did refer to horizontal stripes as vertical ones! CUT! For anyone wanting to see the vlog, you can do so here (you cannot imagine how fast my heart is beating as I type this)! Afterwards I had shots to approve or reject (only one was rejected outright – bad idea for a shot on my part) press releases to approve, a blog post to write , a list of style tips for each outfit and there will be interviews to give and an event to attend. The world of media is pretty foreign to me but the work that goes into these campaigns is amazing. This was a smart work look, with the whole outfit being from Hobbs. The trousers are amazing! A lovely stretch fabric with a high waist and flare at the bottom - comfortable and flattering. A Hobbs shift dress - so easy to wear it's ridiculous! Tapping into the Heritage trend with another Hobbs dress and shoe boots from M&S (probably some of the most comfortable high heels I have ever worn). Wearing a digital print pencil skirt and cardi with sequin Peter Pan collar, all from M&S, as were the shoes (I love the heel on these - high but sturdy). The belt is from H&M. Well, you can't be a "Mum on the Run" and then not design an outfit you could run in! Going for an every day layered look with H&M shirt, M&S sparkly knit, cream H&M jacket and M&S trench coat. The jeans and bag were from H&M and the brogues from Hobbs. The dress on the campaign shot is from Monsoon,the shoes are from M&S and the bag and necklace, are from H&M. I would like to say a special thanks all the team that put this together for Pavilions, to Paul and Emma at S&X [and especially to Emma for holding my hand throughout the process without making me feel like an idiot], Carol the make-up artist who made me look much better than I really do and who so delicately handed me a tissue to sort out my runny nose [it was cold in that building I can tell you] Paul the photographer and Simon for not making me feel too self- conscious and Christie, the runner,for keeping us fed and watered! It has been an amazing experience and I only hope that I have done Pavilions justice! I have been working on a post for a very special announcement due in the next couple of days (well, I'm a bit excited about it although no one else may be!) so this is just a short one. I wore this outfit early last week when I took a trip down to Bristol to see a lovely lady with whom I have worked before. It was a lovely sunny day when I arrived but given my early start, I got dressed in the dark. When I explained this to her, she invited me to look in a mirror but I decided against it, just in case it was a total disaster! Actually, on reflection (ha ha) maybe that is exactly why she invited me to look in the mirror! Needing to keep things simple, and layered just in case it was cold, I decided on black. You can't get much more simple than that can you? I don't tend to wear much black so it was actually quite nice for a change. These trousers, which are gathered at the bottom, are from Jigsaw (sale in the summer). The denim shirt is Next and the jumper, Boden (sale). The necklace is Hobbs (sale last summer) and this was the first outing for my new Rockport loafers which were gifted to me by Push PR after my day out at the Fold. I love these loafers. They make me feel quite tall (that would be the heels) and quite smart (that would be the shine)! I also like the versatility of them as they can be worn with dresses. Feeling that this dress wasn't too dainty for the shoes, I chose to style them with it for my "something for the weekend" look the week before last - and no doubt I will style the with dresses on future occasions. Mum on the Run - Primark and New Look Purchases! As I mentioned, yesterday I was fortunate enough to have time for a wander around the store fondly known as Primarni. First off, I wandered through the knitwear and spotted this striped number. It jumped out at me (excuse the pun), not only because of its stripes but also because of its composition. At 75% wool and costing £12, I thought that it was a great buy. There are also fair isle style jumpers of the same composition but me being me, it had to be stripes! I am interested to see how it wears and washes. Whilst there, I found amongst the knitwear these navy blue snake print jeans. The navy print on navy background made them more subtle than others I have seen, so I thought that they were worth a whirl. They have a slight "wet look" about them but I like them - I think! It's just possible to see the elbow patches on the jumper in this shot, which add a nice splash of colour to the jumper. So, as to the other pieces I picked up. I liked this lime green jumper. It's nice to have an accent colour to all the black and navy during the winter and so this fills that role. I often wear quite alot of coral and hot pink as accent colours, so it's nice to introduce something new. It also comes in pink and a pale blue colour. This picture gives a better indication of the shade of green. It will work with a white shirt layered underneath it and put with black or navy trousers, it will bring a little light to a dull day. I also picked these up in Primark - coated jeans. They are something I have fancied trying for a while and their £15 price tag made them an option, when otherwise they may not have been. I have always found the quality of Primark jeans to be fine, so I am happy to give them a whirl. I like the ankle zips and zip pockets too. I picked this blazer up on my whizz around New Look. It reminded me of a blazer that I saw at a Harvey Nichols fashion show a few months ago now. It is a really flattering fit and nods nicely to the equestrian/heritage trend, whilst not being too obvious. I also like the lilac lining on the turn ups on the sleeves. It's the little things that make all the difference! I also really liked the colours in it, which you can see here - burgundy, browns and navy. It will work well with a denim shirt and my berry coloured GAP cords, plus some brown KG boots which I bought in the sale in the summer. And finally, the denim shirt from New Look which I featured a couple of days ago. This one has pretty pearlescent poppers down the front. I always have that dilemma when shopping in Primark - where are the items made and by whom? Is exploitation involved? Would I be better saving the £50 that I spent on two pairs of jeans and two jumpers on something else? As with everything it's a balance in life. So, generally I buy the pieces, take them home and investigate further. In terms of quality, I see more items of poor quality on sale in Zara - buttons hanging off, seams ripped etc, so I don't consider Primark as disposable fashion. But the stores still drive me nuts after 9.10am! Mum on the Run - Party Party Party! Style Guile Smile - I just love these shoes!